Our Shark Series has been designed especially for those who want economy and performance. While this boat will scoot along at about 20 mph with a 30 H.P. engine, it will really move out with a 50 H.P. long or short shaft engine. The transom is left full so that you may cut it down to either 21 " or 16" for long or short shaft engines. Our Shark Design utilizes the Clark Craft popular hull form that is very maneuverable and planes easily at lower speeds for maximum gas economy. The Shark Cabin Cruiser model PB 135X has a small cutty cabin not meant to be a full fledged cabin model, but it is for those who just want a place to crawl in out of the sun, a private toilet enclosure and sleeping accommodations for two. 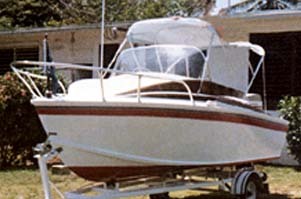 For additional protection from the sun, a convertible top can be installed from the flying bridge windshield aft to the center cockpit. Convertible tops are not supplied by Clark Craft but are easily made locally by an automotive convertible top upholsterer. The Shark Cruiser is a fast, sporty boat and with the Shark hull is extremely manueverable, and runs very efficiently with lower horse power engines.